Please take a few minutes to complete our reader survey and help us make sure you are getting the information you want with Laval Families Magazine. Thank you! How did you first hear about LFM? 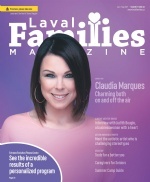 What do you think is missing from Laval Families Magazine, how could we make it better for you? Tick any that apply to you. Which app do you use more often? What is your favourite radio station? : Add me to the LFM E-newsletter & the general mailing lists.